I know there's loads of these out there but I thought I'd give it a shot. 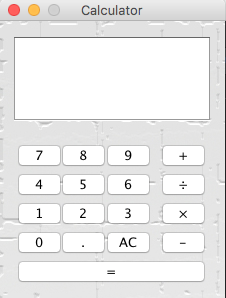 My mate made a calculator but he used a GUI Builder and I personally prefer typing my GUI's by hand. I've finished my first year of university (moving on to my second year) and I'm studying BSc Artificial Intelligence and Robotics, I wanted to test my Java skills considering I finished like a month ago and wanted to see what I could remember. I'm uploading the code here, for any advice as I'd like to type Java with the correct rules, regulations and 'good habits'. So, I'm not sure if I'm a beginner? I class my self as a beginner as I have no idea what level of skill you stop being a beginner at. The code itself is in 6 different separate classes, I've been told previously on StackOverflow to submit my code in one file, so that's what I've done here. I realise that I have a lot of actions for buttons when I could try to limit those and make it more reusable just not sure how. Any help on improving my style of typing code would be helpful, and I appreciate every bit. Obviously the latter is a lot less code for the ten digits. Consider making request a StringBuilder. Or consider making request a collection type. Currently you enter an entire string and then parse it. But you know exactly what operation you are doing when the button is pressed. Then you forget that to put it in a string. You probably don't want it to be a standard collection. A custom class is probably better, as you are adding either a digit, a decimal point, or an operation. The digits and decimal points are parts of a number. The operation is something different. So you want to accumulate digits until the number is finished by selecting an operation. I haven't tried to run this. It's possible that you'd have to pass anInterface.calculatorScreen and request as parameters to the constructor. Note that that works better if request is mutable, e.g. a StringBuilder or collection. You can do something similar with the operations. I find the name ClearButton confusing. I would have expected that to be the AC button, but it's actually the equals sign. And it doesn't clear; it replaces the formula with the answer. I'm not crazy about Main extending the JFrame. I'd rather have something like Calculator extend the JFrame. Then you could reuse Calculator in other programs. Perhaps that is over-engineering for this specific problem, but it seems easy enough to do. And it's a good habit to develop. More of a meta question, but you are welcome to call yourself a beginner as long as you want. If you find that the responses are too beginner-oriented, you can always stop and leave the tag off your questions. Some (not all) people will give different answers as a result. Here you are more than welcome to break your code into parts if it makes sense. In fact, you are encouraged to do so. Stack Overflow wants small simple questions with straightforward answers. If your question is complex, they want you to simplify it to just the essentials. So each question represents just a small, narrow problem. We do broad reviews of your code. We want to see the actual code as it is in your IDE. No simplifying or hiding. Unless you have personal information in the code or code in a language other than English, you should be able to just copy and paste. Not the answer you're looking for? Browse other questions tagged java beginner calculator or ask your own question.